What Does Gun Oil Actually Do When You Apply It to Your Firearm? Proper care and maintenance of your firearm, such as the use of a high-quality gun oil, can make a huge difference in the performance and effectiveness of your gun. Who doesn’t want to make sure that their gun is in the best working condition it can possibly be? Whether using the gun for hunting or self-protection, a properly functioning firearm is imperative. The last thing you want is to have your gun malfunction when you need it most. There are a lot of different types of gun oil on the market. Each has their own set of pros and cons associated with use. When it comes to finding the best gun lube, it can be a bit daunting to wade through the huge number of product and keep all the terminology straight. This easy-to-understand guide will provide the best gun oil reviews to help aid in your choice of gun oil. We will also discuss the basics of gun oil and how to source the right oil for the job. When you have finished reading this guide, you will have the knowledge how to choose the best gun oil for your firearm and why it is so important to regularly clean and maintain your firearm. 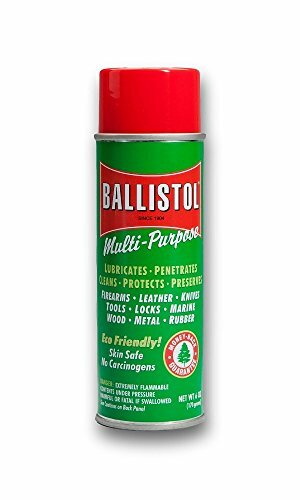 This is a high-quality oil/lubricant that can be used for far more than just guns but works great as an all purpose gun lube. It cleans and reduces the need for manual cleaning, as well as lubricating the moving parts to reduce friction. It was originally developed as an all-purpose gun oil for the German army and was later adapted to general use. Many big industry leaders, including Coca-Cola, use Ballistol oil on their machines. As it is alkaline, it helps to combat the effects that sweat and oil from our skin can have on the firearm. Ballistol is safe and environmentally friendly — it is even biodegradable. It is non-toxic so it is safe to use around pets and family. It is a great value for the money. This is a quality oil that won’t break the proverbial bank. 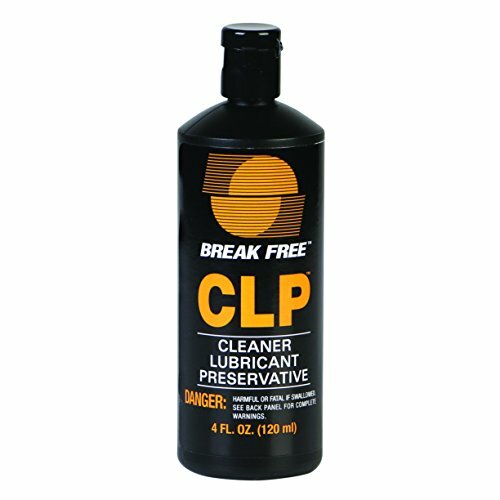 This brand of gun oil is what is referred to as a “CLP” or “3-in-1” type of gun oil. 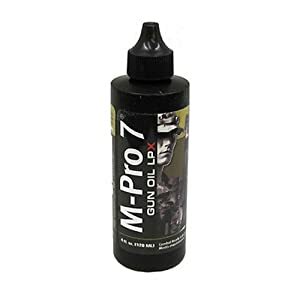 As the name implies, this is an oil that is formulated to clean the gun, lubricate the gun, and to protect the gun from wear and tear, environmental conditions, and corrosion. This is a great gun oil for the money. And comes highly recommended by many different gun enthusiasts. Break-Free is great for keeping a firearm at the ready or for regular use. It is known for its high migration — getting into all the nooks and crannies of the metal to provide the most protection possible. It is long-lasting and highly effective at reducing wear. It is a synthetic oil that is specially formulated to handle a huge variety of conditions from extreme cold to highly saline environments. It won’t thicken or lose its viscosity due to changes in temperature, even if they are dramatic. Hoppe’s is a long-time favorite among gun enthusiasts. It is a high-quality oil that is known for its long-lasting durability. It is specially formulated and has been perfected over the years, giving customers the highest quality oil available on the market. The brand is trusted and the product has proven itself time and time again. The bottle comes with a precision applicator which makes it easy to oil even the hardest to reach places with ease. This is one of the most cost-effective choices and is the oil of choice for more than just firearms users. It is stable under different environmental conditions and will not harden or thicken due to changes in temperature. This is a great, all-purpose oil that never goes rancid and keeps your firearm in tiptop shape. This is a high viscosity oil which allows it to maintain stable over time and through different environments. This is a specially-designed lubricating gun oil from the well known and reputable Hoppe’s No. 9 brand line. This oil was formulated for guns — new guns to be particular. This means that it is a specialized blend that is perfect for everyday use on all firearms. This specialized blend is intended for use on firearms only. It also works great on other mechanisms like fishing reels that require high-quality lubrication. It is specially blended to be stable across a wide range of temperatures. It provides enhanced protection against water damage and is packed with anti-corrosive compounds to provide added protection to your firearm. This is a well migrating formula that provides excellent lubrication to help protect against wear and tear and to help lengthen the life of the firearm. This is another affordable, high quality all purpose gun oil. It was formulated to be a general purpose oil and is a great deal for a quality oil that is suitable for firearms from all time periods and styles. M-Pro 7 Gun Oil LPX is a 3-in-1 gun oil that acts as a cleaner, lubricant, and protectant. The formula works to repel dirt and other sources of gunk and grime. It is a high-quality lubricator that keeps all mechanisms operating smoothly and reducing friction that causes wear and tear on firearms. In fact, it boasts one of the lowest friction coefficients available. It is also formulated with additives that are designed to protect against corrosion and other environmental stresses. The lubrication also acts as a barrier to dirt and dust and is a long-lasting formula that will not evaporate or thicken, even under temperature variations. 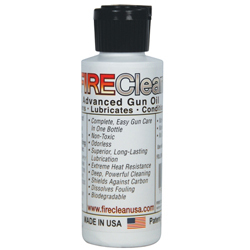 FireClean is another all purpose gun oil that is specially formulated to deep clean and reduce carbon fouling on firearms. Made in the USA, this is a specialized formula that is designed to condition metal to resist fouling. This makes all future cleanings less work and hassle. This is an excellent gun oil for those who find themselves cleaning their gun a lot. 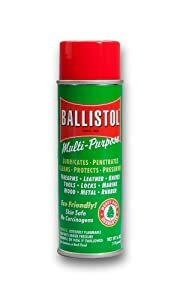 It contains powerful cleaners that break down grime and make ridding your firearm of carbon fouling as easy as wiping it off. It is stable at extreme temperatures, both hot and cold. It is made from an earth-safe biodegradable formula that is also non-toxic and thus safe to use around family and pets. FireClean is also a top notch, a high-quality lubricant that is long-lasting and reduces friction that causes wear and tears on firearms. First and foremost, you might be wondering why lubrication is such an important part of routine firearm maintenance. This, like most aspects of firearm maintenance, is not that difficult. It just takes a little experience and choosing the right oil for the job. Lubrication is important as it helps to prevent wear and tear on the firearm and to allow it to perform at its highest level. In order to achieve both of these aims, you need to keep the moving parts from directly rubbing against one another as much as possible. A nice layer of oil literally helps to grease the inner workings and allow them to function with minimal friction, thus reducing wear and tear. Not only will keeping your firearm appropriately lubricated ensure that it works at its optimal level of performance, it will also extend the life of the gun. In short, lubrication is part and parcel of responsible gun ownership. It keeps the firearm functioning properly and without undue friction. It is probably most accurate to say that what you want for your gun is more akin to grease, which is simply a thickened oil. With grease, oil is mixed with one of a variety of bases to achieve certain characteristics depending on needs. The base is most commonly a metallic soap-like substance. Some of the bases will help reduce oxidation. Other bases are meant to help improve the firearm’s resistance to water or extremely cold weather. Depending on the environment you will be using the firearm, the type of base that will work best will vary. There are different grades of grease too. They are denoted with what is referred to as an NLGI number. The smaller the number, the thinner the oil/grease is. The higher the number, the thicker the finished product. This can be very helpful when determining which is the best type for your needs. When you begin to look at different gun oils, one of the first things you will notice is that there are a lot of specified additives that are utilized to provide different functionality when added to the oil. You will see AW/EP quite frequently when looking at gun oils. This means anti-wear and extreme pressure. A good quality gun oil is going to have a lot of these additives to help keep the gun in the best working order possible. These additives are tiny solids that are mixed with a straight oil to thicken it and add additional properties to the mixture. There are a huge number of different mixtures that are tailored to particular needs, concerns, or environmental protections. There are literally hundreds of different additives that are utilized to give the final product the desired thickness and other properties. Depending on whether or not you plan on using your firearm often, or storing the gun for later use, the type of oil that will work best for you will vary. 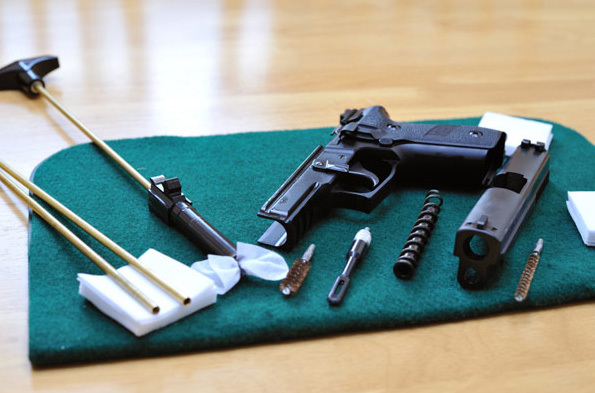 Guns that are well maintained and cleaned will fire properly every time, even when coming out of long-term storage. If you live in humid southern regions or salty coastal areas, rust will be a bigger concern than for those who live in more temperate areas. Gun owners who live in these regions are encouraged to use a gun oil that has a lot of rust prevention additives. If you are planning on using the gun in extreme cold, you will want to look for an oil that is specifically designed for these conditions. There are a huge wealth of different products to choose from. The brands reviewed here are, by no means, the only good gun oils available on the market. However, they are some of the most popular and dependable brands that are the best value for the money. It helps to know what type of protection and use your firearm will need and experience. This will help determine what formula of oil will work best. It is important to understand the basic components of gun oil and what you need for your firearm. There are plenty of new products that are added to the market each year that tout themselves as the best, but too often we just end up with a few bucks less and a useless product. These oils come in a wide range of formulas and come with a wide range of price tags. There are a lot of gimmicks in the firearms market, but oil is not one of them. This is one of the most important aspects of routine gun maintenance and a high-quality oil is worth the money and will prove itself by providing continued optimal performance every time. Guns need to be cleaned and oil well and often to help ensure they work their best. As noted earlier, gun oil is intended to act as a barrier between moving parts. This is used to help the parts slide across one another easier and with as little friction as possible. You may look at your firearm and see a perfectly smooth metal surface, but, in fact, this is not the case. If you look at your firearm under a microscope, you would see that the surface of your gun is, in fact, pitted with tons of tiny little craters that, if left unoiled, will grind against one another and cause wear and tear to your weapon. When you apply gun oil to your firearm, you fill all of these depressions with a slick substance that aids in reducing friction and allowing the different mechanisms to function without contact. This allows the firearm to function at its optimal level of performance and also reduces undue wear on the weapon as well. In technical terms, this is what is referred to as “hydrodynamic lubrication.” The gun oil allows the moving parts of the gun to “ride” along the oil to aid in friction-free movement. The only problem is that without what is called a “boundary,” which is an additive that thickens the oil, the oil will simply squeeze out of the nooks and crannies when the firearm is engaged. A gun oil with an added boundary substance will have more solidity that will allow it to coat the inner parts of the gun in a way that won’t just be pushed out when the gun is engaged. The boundary substance helps give the gun oil its protective qualities that keep the pieces from wearing each other to nothing and ruining the weapon. Gun oils are also designed to provide an array of protections for your firearm as well. Many of them include different anti-rust agents, anti-wear agents, and compounds that are designed to handle extreme pressure. Depending on where you live and what kind of use your weapon will see will determine which formula will work best for you. Oftentimes, there are detergents that are added to gun oils. This means that when the oil is applied, it is also working to break down dirt and other grime that might gunk up the gun. 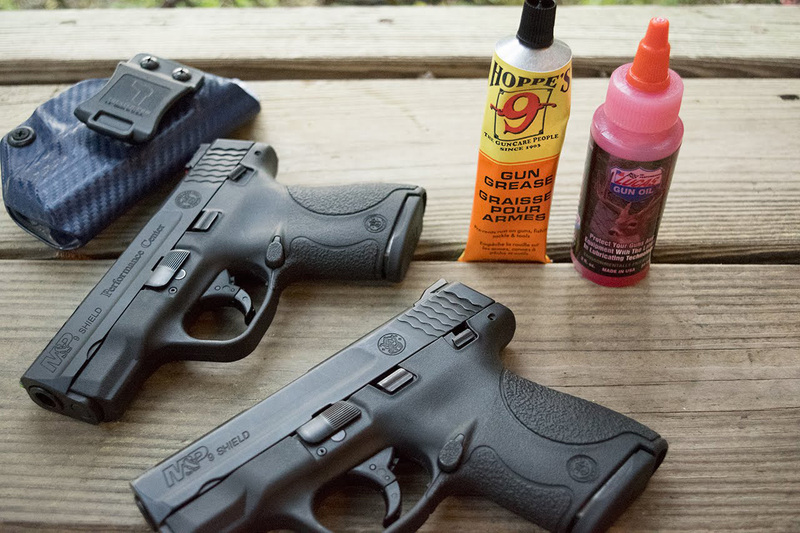 In short, gun oils also work to clean guns as well as keep them lubricated. This is important as grime and dust can get inside a gun and cause it to malfunction. Guns need to be cleaned as a part of routine care. If you have chosen a 3-in-1 gun oil, you have a product that is intended to clean the gun, lubricate the gun, and to provide protection against things like water and oxidation. These products provide a great all purpose solution for routine firearm maintenance. They might not be suitable for all needs, but for general purpose maintenance, they do work pretty well. A lot of people like this option due to the simplicity of having just a single product to apply, as opposed to a number of different products for different purposes. 1) Gun oil cannot solve all problems. If there is too much wear and tear or there are broken or aging parts, no amount of oil, no matter how high quality, will fix the problem. Guns still need to be taken apart and cleaned. You cannot rely on gun oil to clear all grime and debris, though it does work well for regular maintenance. 2) Most of the “failures” of gun oil have to do with user error, not any problem with the oil itself. You need to learn how to properly oil the gun. There is such thing as too much or too little oil and using too much or too little can cause problems with the firearm. It is important to be sparing in your use of gun oil. A little goes a long way, but at the same time, you need to make sure that everything is adequately lubed. Finding that sweet spot takes practice and experience, but once you find it, oiling your gun will be a snap. 3) There’s no such thing as a miracle gun oil. Companies that make gun-related products are no different than any other company. They are out to make money. To do this, they need to regularly introduce new products and then create hype so that people go out and buy them. Oftentimes, these products claim to be “miracle products” and come with a hefty price tag. Don’t be swayed by gimmicks. Do your research and find a good value that does what you need it to do. If it comes with a lot of bells and whistles, chances are it is just a money sink and an old standard works better at half the cost. 4) Gun oil is often formulated for specific environmental conditions. All-weather formulas exist that will do the trick in any condition, but there are specially formulated blends that are designed for specific environmental factors. 5) Regular use of a high-quality gun lube is a great way to improve performance and extend the life of your firearm. 6) Gun oil is actually a formulated blend of oil and a variety of different additives. Some of these additives are to make the oil thicker. Detergents and other compounds are added to many oils to give them cleaning properties. Anti-corrosive agents and those that help improve water and weather resistance are also added. 7) Boundary agents are added to pure gun oil to give it enhanced properties and to make it thicker. These agents are what keep the oil from simply squirting out of the places it is needed when engaged. Boundary agents make the compound just thick enough to stay adhered to the surfaces where it is needed, but not so thick that it causes the mechanisms to get stuck or be prone to build up. 8) The most expensive kind is not necessarily the best kind. A high-quality gun oil is not going to be the cheapest brand on the market, but it is not the most expensive one either. Look for a trusted brand with a reputation for quality. Any of the brands reviewed above are great values for the money and work for a variety of different needs. There is no one answer to how much important the gun lube is. It really does depend on a variety of factors including how often you use the gun, what type of environmental conditions it will be exposed to, and more. Whatever gun you have (rifle or pistol, firearm or airgun)Having a basic understanding of what oil is comprised of and how it works helps you to make the most informed decision possible. With the above best gun oil reviews and the easy-to-understand guide, you now possess the information you need to choose the right oil and maintain your firearm properly. A well-oiled gun fires perfectly every time, no matter how long it has been since its last shot. Our team always never stop scouring the net searching for the best products for guns and shooting enthusiasts. All what you need is to visit Shooting & Safety in order to find loads of reviews accompanied with best products.